Our rooms for your comfort. The right room for everyone! Our single business room is equipped with free WiFi, a large desk, a safe and many outlets for your electronic devices. The light furniture and the 160x200cm king size bed will make your stay even more enjoyable. Additionally the ca. 18qm room offers a bathroom with a shower and a toilet, a blow dryer and a make-up-mirror. All rooms have cable TV (LCD), a radio alarm clock and a phone. Our standard single rooms are approx. 18 square meters and have a king size bed (160 x 200 cm), a bathroom with a shower, toilet, hairdryer and cosmetic mirror. The rooms are equipped with cable TV (LCD), radio alarm clock, desk and phone. Internet is available in all rooms via WiFi. Single room “for 2 people”! Our spacious 18 square meter standard single room can also be booked as a “small double room” for 2 people upon request. This is an inexpensive offer for 2 people who appreciate the closeness in the the bed size (160 x 200cm) of the standard single room and do not need more room space! Our double rooms (2 rooms, some with a balcony) are equipped with two beds (90 x 200 cm) within 28 square meters with a small living room providing sufficient space and comfort. As in all rooms there is a bathroom with a shower, toilet, hairdryer and cosmetic mirror. The rooms are equipped with cable TV (LCD), radio alarm clock, desk and phone. Internet is available in all rooms via WiFi. Our luxury room is approx. 35 square meters large and consists of 2 rooms (separate living room and bedroom) with either two single beds (90 x 200cm) or a king size bed (160 x 200 cm). There is also a sofa in the living room to make your stay with us even more pleasant. As in all rooms there is a bathroom with a shower, toilet, hairdryer and cosmetic mirror. The rooms are equipped with cable TV (LCD), radio alarm clock, a large desk and phone. Internet is available in all rooms via WiFi. A 3rd person can be comfortably accommodated on the bed-sofa (140 x 200cm) if requested. Our ca. 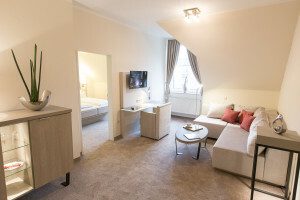 35 m² big comfort-class superior rooms (partially 2 rooms split in bedroom and living area) with a comfortable seating area offers more than enough space to enjoy your stay with us in Oldenburg. A large work desk and enough outlets ensure a comfortable work environment. The rooms is also equipped with a closet safe. Internet is available free of charge via Wi-Fi throughout the hotel. Room facilities: double bed (180 cm x 200 cm), modern bathroom with shower, toilet, hairdryer, cosmetic mirror, cable – TV, Radio Alarm Clock, closet safe, telephone, fridge and electric kettle (Welcome tray). Our Family room is approx. 35 square meters large providing a comfortable stay for 2 adults and 2 children. The bedroom is furnished with a king size bed (160 x 200 cm), the living room with a sofa bed (140 x 200 cm). In addition there is also a kitchenette. As in all rooms there is a bathroom with a shower, toilet, hairdryer and cosmetic mirror. The rooms are equipped with cable TV (LCD), radio alarm clock, desk and phone. Internet is available in all rooms via WiFi. We are at your service for all your questions regarding the availability, room type, occupancy or equipment. We will find the ideal solution for your stay with us!